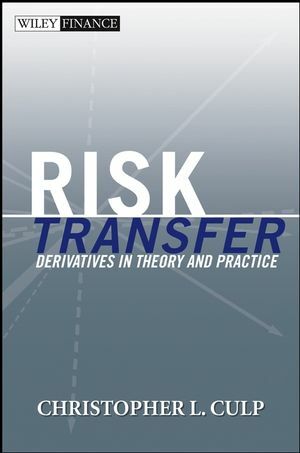 Based on an enormously popular "derivative instruments and applications" course taught by risk expert Christopher Culp at the University of Chicago, Risk Transfer will prepare both current practitioners and students alike for many of the issues and problems they will face in derivative markets. Filled with in-depth insight and practical advice, this book is an essential resource for those who want a comprehensive education and working knowledge of this major field in finance, as well as professionals studying to pass the GARP FRM exam. Christopher L. Culp, PhD (Chicago, IL), is a Principal at CP Risk Management LLC and is also Adjunct Professor of Finance at the University of Chicago. He is the author of Corporate Aftershock (0-471-43002-1) and The ART of Risk Management (0-471-12495-8). CHRISTOPHER L. CULP is an Adjunct Professor of Finance at the University of Chicagos Graduate School of Business, a Principal at Chicago Partners LLC, and, during the winter academic term, a Resident Guest Professor of Risk and Insurance in the Institut für Finanzmanagement at Universität Bern in Switzerland. Culp is an active consultant to various financial and non-financial firms on risk management, financial instrument selection, and capital allocation. In addition, he is an independent non-executive Director of Idaho Power Company, Inc., and IDACORP, Inc., where he is a member of the Audit and Governance Committees of both boards, and he is a Senior Fellow in Financial Regulation with the Competitive Enterprise Institute in Washington, D.C. Culp is the author of two previous books (both published by Wiley), The ART of Risk Management and The Risk Management Process. He recently coedited for Wiley (with William Niskanen) Corporate Aftershock: The Public Policy Lessons from the Collapse of Enron and Other Major Corporations. Culp holds a PhD in finance from the Graduate School of Business of the University of Chicago and a BA in economics from the Johns Hopkins University. Preface: The Demonization of Derivatives. Introduction and Structure of the Book. PART ONE: The Economics of Risk Transfer. CHAPTER 1: The Determinants of Financial Innovation. CHAPTER 2: Risk, Uncertainty, and Profit. CHAPTER 3: Methods of Controlling Risk and Uncertainty. CHAPTER 4: Risk Transfer and Contracting Structures. CHAPTER 5: The Evolution of Derivatives Activity. CHAPTER 6: Derivatives Trading, Clearance, and Settlement. PART TWO: Derivatives Valuation and Asset Lending. CHAPTER 7: Principles of Derivatives Valuation. CHAPTER 8: Own Rates of Interest and the Cost of Carry Model. CHAPTER 9: The Supply of Storage and the Term Structure of Forward Prices. CHAPTER 10: The Term Structure of Interest Rates. CHAPTER 11: Basis Relations and Spreads. PART THREE: Speculation and Hedging. CHAPTER 12: Speculation and the Speculative Risk Premium. CHAPTER 15: Quality Basis Risk. CHAPTER 16: Calendar Basis Risk. APPENDIX 1: Economic Theory and Equilibrium. APPENDIX 2: Derivation of the Fundamental Value Equation. APPENDIX 3: Relation between the Cost of Carry Model and the Fundamental Value Equation.